Even though we should’ve been dining on the complimentary meals at the Baguio Holiday Villas, we took the time to dig inside our not-so-deep wallets and decide to hunt Baguio City’s Session Road for evening grub. We wanted to eat where locals eat, something traditionally Baguio. Walking under the chilly, uphill sidewalks of Session Road and skillfully dodging the early evening crowd; we chanced upon an eatery that seemed to have stopped catching up with the present time; Luisa’s Café. I’ve been noticing this cafeteria every time I set foot on Baguio, being named after an old crush of mine. But entering and actually dining inside never even entered my mind. First, Luisa’s didn’t look that inviting with its very spartan interiors, and second, their menu prices ain’t really that cheap—well at least in my book. Little did I know that this little hole in the wall along the city’s busiest thoroughfare is considered by Baguio’s veteran journalists as home. Here, Cordillera media guys spend their slow precious after office hours, sipping coffee and drinking beer, talking over headlines and probably all matters under the sun. Luisa’s Café serves mostly Chinese food. 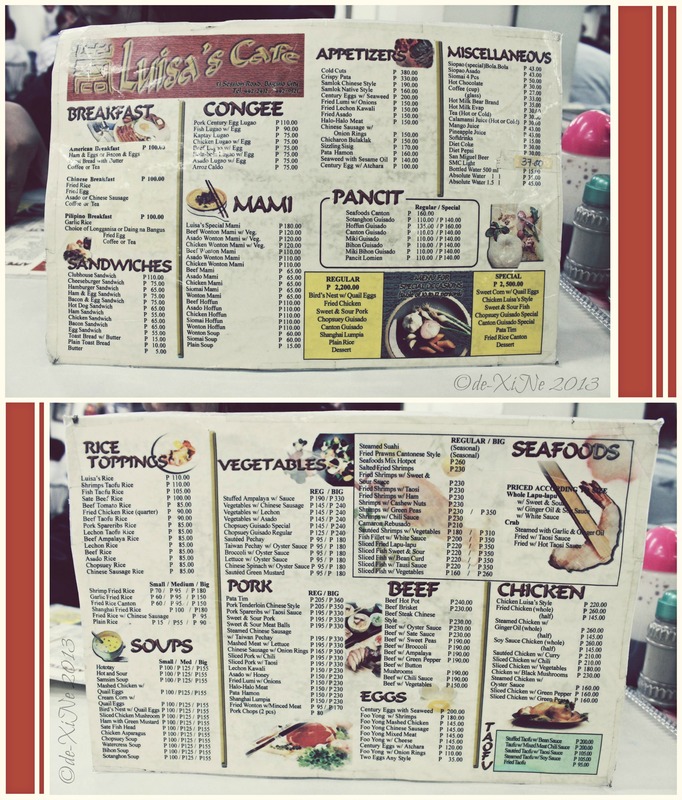 Congees, mamis, pancits, soups, century eggs and siopaos mostly make up their menu. But they also serve your everyday breakfast meals and sandwiches. I heard their coffee to be extremely popular with the locals; unfortunately, we didn’t get to try it out. Stepping inside the two-storey cafeteria is like stepping into a time-machine and being churned a few decades back. The walls, bare except for the cream-colored paint job. The tables, made from wood topped with formica the same color as the walls. The chairs, a throwback to the 80’s complete with faux maroon leather. But nothing beats the fact that they still have dumbwaiter made of wood to transport food to and from the second floor! It reminds me so much of a now-closed Chinese restaurant in front of Hotel Veniz I’ve tried before. It is as old-school at it can get. Talk about throwback Thursdays. With no idea what to order, we simply asked what their bestsellers were. We were told that their siopaos were the best. We believed, and ordered two. An asado and a bola-bola (Php43.00 each), without hesitation. Since the night was getting colder, we also added bowls of chicken and wonton mamis (Php65.00 each). Serving time was pretty quick; our orders squeakingly arrived via the dumbwaiter in less than ten minutes. The mami looked delicious and authentic but upon sipping, tasted quite average. In hindsight, we should’ve ordered their asado mami, which I read is excellent. The siopao, especially the bola-bola, were a different matter though. Well, I guess it didn’t garner the title Siopao (special) Bola-Bola from their menu for nothing. It’s one of the best I’ve tasted. We would’ve ordered a couple of Red Horse beer to finish our meal off, but alas, they only have Pale Pilsens and SanMig Lights available. The lulling sound of the busy evening traffic along Session Road called back to us after finishing our very Chinese dinner. Along with the legendary Star Café, Luisa’s Café is one of the many relic restaurants just waiting to be discovered by the younger generations of travelers visiting Baguio City. GPS Coordinates: +16° 24' 47.05", +120° 35' 49.56"
Sarap ng feeling ng after a long day hihigop ng mainit na sabaw.. Really looking forward for our Baguio trip this Dec.